An award winning product for most instant whitening results. 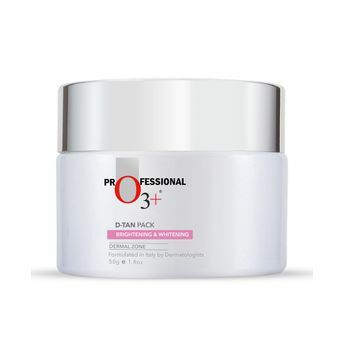 The O3+ Tan Removal Pack has 8 benefits in just 1 jar as it hydrates, nourishes, soothes, calms, heals, whitens, brightens and lightens the skin. The goodness of mint and eucalyptus oil cleanses the skin while providing instant brightening and lightening benefits. About the Brand: India's leading number 1 professional skincare brand, O3+ introduces the Plunge USA skin care and cosmetic range. Innovative and playful, these high quality American skin care and cosmetic products combine natural ingredients with playful twists, but no harsh chemicals and parabens. Explore the entire range of Masks & Peels available on Nykaa. Shop more O3+ products here.You can browse through the complete world of O3+ Masks & Peels .Alternatively, you can also find many more products from the O3+ D-TAN Pack range.